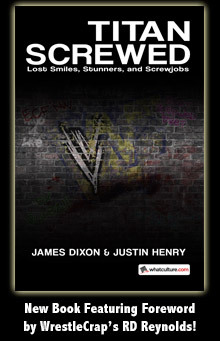 Saturday Morning Slam 01-19-13 - WrestleCrap - The Very Worst of Pro Wrestling! Oh yeah, time for my favorite 30 minutes of the week (that have anything at all to do with wrestling): SATURDAY MORNING SLAM! As I recall, last week was an acceptable show, but it was lacking a bit in the goofball department which I’ve come to expect from this show. Here’s hoping that we get some of that this week. Still, I do enjoy hearing about Booker and Alicia’s golfing exploits. Apparently she is quite the golfer. I now know this because Booker brought it up, oh, I don’t know, 5,000 times in the span of 4 minutes. I bring this up for not so much because it annoyed me (which it did, but in a minor way, like when you get an ice cream headache or something) but rather because it gives me a lame excuse to post a classic Bobby Heenan bit with him on the golf course with Gene Okerlund. Go ahead, enjoy. I will be here when you get done. I’ve seen worse. It also doesn’t go on too long (I wanna say maybe 5 minutes or so), which is another plus. Natty picks up the win with the Sharpshooter, so for all you geeks who have been bellyaching that she needs to get a push, there you go. She’s getting one. Too bad for her it’s on Saturday Morning Slam. Call me a jerk for making fun of kids, but I am in earnest when I state that should RD Jr. ever leave the house looking like this I may just change the locks. I don’t think I’d be excited about any year named after feces. Commercial time again and whoa whoa whoa…what is this? They’ve given Chuck E. Cheese ANOTHER makeover? So now he’s small, approximately the size or a real rat. Kinda looks like one too. 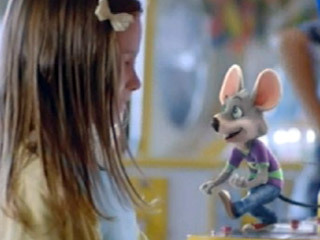 I don’t know that see something more accurately resembling a rodent makes me want to go to a pizza place. Especially with young kids. Ok, so she got the guy wrong, but she was quoting GARY SPIVEY to me. What a completely amazing woman. So the two start off, and it doesn’t take long ’til Sheamus steals Rey’s spot with McGillicutty, having him run the ropes for no reason. I’d get hot about that, but a) I love that spot and b) Sheamus goes out, sits at the announce desk, and drinks a bottle of water. To commercial we go again. You have no idea how much I hope that McGillicutty is still running the ropes when we get back from the break. Back from commercial, Sheamus is our DO NOT TRY THIS bit, and they show him walking, posing, and staring. So yeah, don’t do ANY of those things. In the arena my prayer has been answered, as McGillicutty is STILL running the ropes. 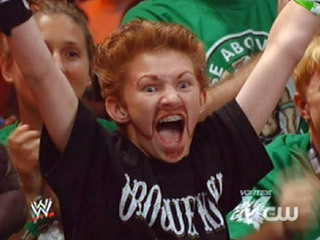 And somehow, it gets EVEN BETTER as Sheamus gets in the ring, and shares his bottle of water with the poor guy. He then proceeds, and with the Good Lord above as my witness and I am NOT making this up, to roll out of the ring and try to HIDE from from his foe. Doesn’t help, as Sheamus kicks him right in the fart chamber. Sheamus rolls him back into the ring, and gives him another SMS staple, the airplane spin. As you would guess, this causes McGillicutty to be absurdly dizzy, but he recovers and gets the pin! Sadly for him, he pinned the referee instead of Sheamus. I know it’s only three weeks into two-thousand turdteen, but there’s your match of the year. And yeah, Sheamus picks up the win with the White Noise. Back to the rope running…as that is now the McGillicutty’s ‘move’, I really hope that one week he is in the opening match, starts running the ropes, and then they have a bunch of recaps and packages and they come back to him at like the 28:00 mark and he’s still running the ropes. 12 Responses to "Saturday Morning Slam 01-19-13"
Wow, this sounds pretty awesome. I always have saturday mornings off, maybe I’ll have to bunker down and give it a look. McGillicutty might be my favorite WWE superstar after today’s cardio challenge. He’s the new Cardiac Kid. You’ve successfully convinced me this is the best wrestling show on TV and I need to pull myself out of bed to see this. I might be getting old but somehow I liked my first show of SMS. The silliness of the Sheamus match made sense for a childrens audience. I just wonder why they show silly crap like this on all the other WWE broadcast as well? Mrs. Deal quoting Gary Spivey? Michael Mcgillicutty willing to making a fool out of himself? I’m watching the main event and wondering when the hell WWE started turning into Chikara. Thanks for that Heenan and Gene spot. That was priceless. Also…SEAN MOONEY! These recaps have been interesting but the mere thought of that match has convinced me to start watching this on a regular basis. McGillicutty is also the master of the Mr. Perfect (don’t know why he doesn’t use his real last name) “kick out my leg and I do a flip while holding the ropes” spot as well, it seems. I liked this guy on NXT/FCW when paired with Johnny Curtis, this tops those matches by a mile!